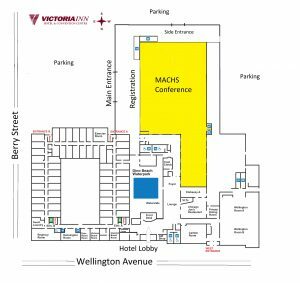 The conference is at the Victoria Inn Hotel and Convention Center 1808 Wellington Ave Winnipeg MB. $140/night by calling the front desk directly (204) 786-4801 and request M-A-C-H-S group or use # 851740 to book rooms reserved by MACHS. Please note: If you find a better price online, call the hotel to match it. Booking directly with the hotel should give you the best service possible, including cancellation, rather than booking with a third party. Waterpark with pool, slides, and hot tub. located across the parking lot from the conference center. If you are willing to stay offsite, there are a number of hotels within a 5-minute walk, including the Hilton, Country Inn & Suites and Comfort Inn. Free parking is available at the conference center. Enjoy! To find restaurants in the area, click here.